I think I've finally pinpointed why I keep getting CVS exceptions every few minutes, at best. This seems related to having excluded directories that are actually under version control. You see, stupid people are everywhere. A long time ago one of those people thought it was a good idea to add compiled class files and other generated stuff to the CVS repository. Unlike them, however, I don't think this is the brightest idea, so output paths are excluded from my project, and of course, I don't (or try not to) commit anything changed there. Now two things happen: first, modified/removed files under these excluded directories are shown ungrouped in the commit window (see attached file). Second, an exception pops up every now and then, when the CVS support tries to get the virtual path to ignored files and gets a null back. So... can we have CVS support to actually ignore files under excluded paths? since it might be already fixed. Keep up until next EAP. Patiently awaiting for the next build, Maxim. 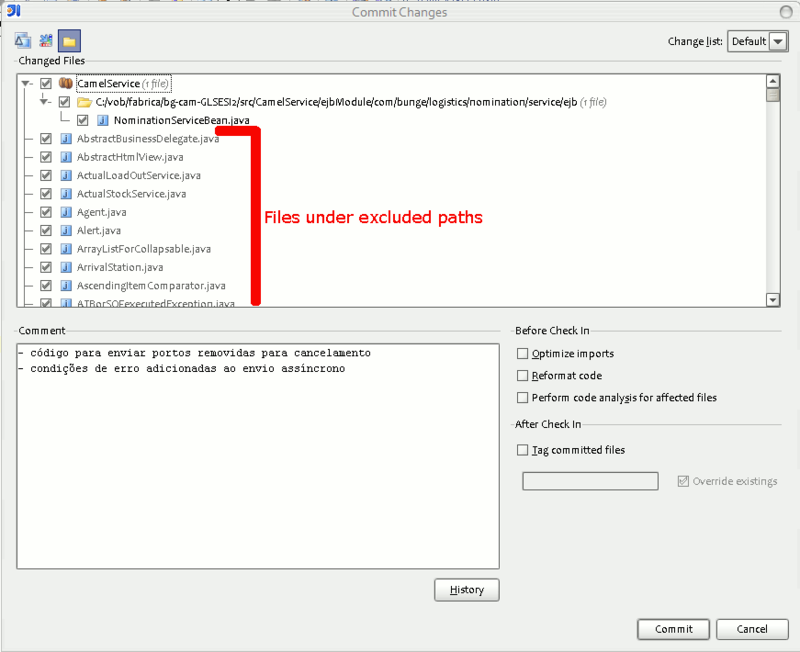 Could you at least reproduce files under excluded paths shown as a flat list in the commit window? A restart of IDEA returns things to normal thou. Very annoying..